Christ chose ministers to serve the people who were seeking the kingdom of God. 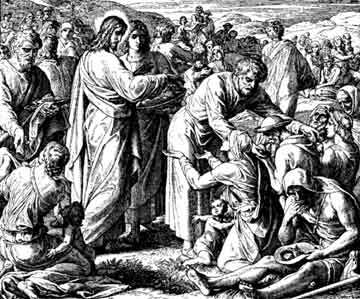 They took care of the needy of that society as they taught the ways of Christ. The were to receive, preserve, and propagate His doctrines and ordinances as a body or community, united under one form of government by the profession of one faith, and the observance of the same rituals and ceremonies. Those rituals and ceremonies were nothing more than the ways in which they took care of one another and conducted themselves in the world and with each other. All governments take care of the needs of the people they serve, but they do not all provide the benefits of that society by faith, hope and charity nor the perfect law of liberty. As ministers one to another we are commanded to feed the sheep who follow Christ and the ways of His kingdom. Who is truly a minister of Christ? How will we know them? Can we ordain men as ministers of Christ, of His Church? The ministers of God are ordained of God but as the seekers of His kingdom each of us must learn to recognize who is God's minister and who is not. As God writes upon your hearts and upon your minds we should learn to recognize the ministers of God and in bearing witness to our faith in God we may also bear witness to those who serve Him. God desires that the diligent people who live by His love remain free souls under God. The ministers who facilitate the Love of Christ in the daily ministration to the people are the true servants and those who send the people to men who call themselves benefactors but exercise authority take the Lords name in vain. It is the responsibility of the people and true ministers of God to bear witness to the Father by bearing witness to leach other. God establishes His Spirit but the world does not see things of the Spirit so we have created a chain of authentication where the people may bearwitness to their faith in God by bearing wiitness to one another. 1 These forms and documents, along with other identifying records and regular reports, are used as official documentation of the Church for a record of authentication and identification of the congregation, for the protection of its Altars and offerings, and for the consideration, acceptance and assignment of a Minister of the Church, licensed or commissioned. There are numerous forms of self government that are a part of edifying the Kingdom of God which we are sent to preach. There are mysteries that have been forgotten or are poorly understood which will aid and guide us in the establishment of a free church, establishing congregations of free people, or forming a religious brotherhood of faith and love according to the orderly arrangement laid down by Christ and the prophets for the daily ministration. Forms are documents that mark and give evidence of the presence of Church and congregation. They aid in the performance of our duties one to another and they create a chain of authentication that the world can see to protect the people from abuse and usurpation. Ultimately it is the Holy Spirit, often manifested through the hearts and hands of every man, that is our protector. These forms are like road maps that assist in establishing a record of the essential aspects and precepts, They assist in the networking of the kingdom and establish a clear bar to stop the intrusion of the world into matters of the Kingdom of God and the Church. They form the markers and boundaries and walls of our city and holy nation, God’s temple of living stone, in a way where the world can clearly see the evidence of spiritual truths. Liturgy is defined as “a prescribed form or set of forms for public religious worship.”1 It is from the Greek word leitourgi and leitourgos, meaning public service and public servant respectively. Liturgy was not about singing and vestments and the smoke and mirrors of modern Christendom. Liturgy is about the public servants of the Kingdom of God operating under the perfect law of liberty in true worship of God by service to the people. Liturgy is the common procedures of the public servants of God’s kingdom in congregations composed of, by and for the people. The free systems of tens, hundreds and thousands bound together only by brotherhood and love, have been the predominant form of successful voluntary government throughout man’s history. Similar cell patterns were evident in the early Church and throughout Europe during the first Millennium. The crucial ingredient to their success was the implementation of the Ten codes of God’s law summarized in the virtuous application of Christ’s two commandments. Love God and His ways with all that you think and do and actively love your neighbors rights to his property and family, his life and liberty as much, if not more, than you love your own. The Church that comes together according to these ancient patterns and righteousness can overcome all tyrants, despots, and enemies of freedom under God. They can weather the greatest storms and cataclysms of history both past or future. They can and will inherit the earth with the humility of their love in daily sacrifice, which is the communion of Christ. A godly administration is not a kingdom or government where service is compelled by men who make laws demanding homage and allegiance contrary to the ways of God in Heaven. Having no other gods before God means that we apply to the Father Creator only, that we call no man on earth father in word or deed, but our Father in heaven. We do not covet the benefits of rulers who take from our neighbor. The public service prohibition stated by Jesus to His ministers was that they were not to exercise authority like the princes and rulers of the other nations.2 And when publicly proclaim His name as His children we must remain true to His ways and character with all that we do and say in full faith and allegiance to His virtues of love and charity. God’s ministers and all those people who seek His kingdom, who minister one to another, do not exercise authority nor compel the service and labor of their neighbor in accordance with the liturgy of Jesus Christ, must not forsake the coming together the assistance of the congregations of the People and the Church. They are to worship and pay homage to the God of us all and our King, Jesus the Messiah through an active network of faith, hope, and charity, which is love. These records are dependent on the separate and distinct nature of the Church and its ministers of the congregation of the people. We also will require the formation of recognized congregations and Churches of Record based on biblical precepts of the kingdom of God, including two or three witnesses and a chain of agreement with in the record of the people.